Tips for Expecting Parents by Lindsay Pinchuk of Bump Club + Win a Month of Huggies Little Snugglers! This post is brought to you by Huggies. We’ve partnered with Lindsay Pinchuk, founder & CEO of Bump Club, to provide this wonderful list of tips for expecting parents. 1. You are now CEO…of your family. Remember: you have to do what is best for you and your family—not anyone else. This is in regards to anything and everything: feeding, diapering, bathing, where to live, what to buy, schools, day care, etc. While we appreciate our family’s suggestions, don’t feel any pressure and do what’s best for you! Whether you are going to have a shower or not, create a registry. You only have your first baby once and people will want to buy you and your baby presents! You would rather get items you want vs. ones you don’t, so making a registry is key. Bring a friend with you who just had a baby, or have her look over your registry. Baby gear changes every few months, and it’s great to know what is new and necessary. 3. Don’t overthink the obvious. Make sure to include diapers on your registry. So many people leave them off, but they are the #1 item you will be using when you bring the baby home! I love new Huggies Little Snugglers. The GentleAbsorb* Liner has hundreds of tiny absorbent pillows to draw mess away from your newborn’s delicate skin. Huggies Natural Care Wipes are also great because of the simple formula and Triple Clean* Layers that are tough on messes, yet gentle on baby’s skin. 4. When it rains it pours, but try to curb the shower excitement. Don’t open every box and item you receive from your baby shower before you come home from the hospital. Inevitably there are going to be items you don’t use or will want to return once the baby arrives. Only open what is absolutely needed for when baby arrives home and use things as you need them. 5. Baby brain and mommy brain are for real. Just know that no matter what happens, the love you will feel for your baby on the other end of your labor and delivery is indescribable. Thank you Lindsay Pinchuk for the great tips! Now on to the even more exciting part! 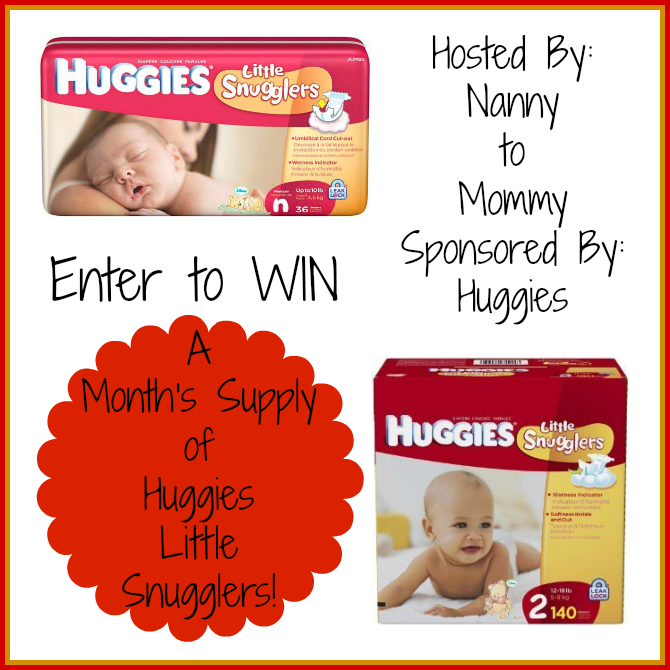 Who would like to WIN a month's worth of Huggies Little Snugglers? A recent survey, conducted by Huggies Little Snugglers, found nearly 75% of new moms anticipate changing fewer than 2,500 diapers in their baby’s first year, but the reality is that the average mom will change 3,500+! So every little bit helps! Entry is SIMPLE, just follow the prompts on the Rafflecopter below! Open to US only, must be 18+ to enter! I received free products to share this information and giveaway. All opinions are my own. Giveaway is open to US only and entrant must be 18 or older to win. One entry per household/IP address. This post contains affiliate links. Nanny to Mommy is NOT responsible for sponsors who do not fulfill their giveaway obligations. Winner is chosen via random.org, ALL winning entries are verified. If you would like to sponsor a giveaway, please email Diana.n.chastain@gmail.com. Don't be afraid to ask for help or take people up on their offers. It could be having a meal brought to you or someone to watch the baby while you do something for yourself - sleep, shower, get coffee, etc. My suggestion to first time parents is to relax a little and get plenty of sleep before baby comes. Keep calm even during the toughest of times and stick to a schedule, especially for bedtimes and sleeping. Get your rest whenever possible. Keep calm even during the toughest of times and stick to a schedule. That will save your sanity and get you rest. My suggestion is to listen to your instincts. People will give you tons of advice, whether you ask for it or not, and you need to just do what is best for you! My best tip for new parents is if family and friends offer help after the baby is born take it! I know you want to be independent and not have "help" from anybody because "it's our baby" but trust me you will be wore out soon enough so if Grandma and Grandpa wants to keep the baby an hour or so let them and get some much needed sleep or get some of that pile of housework done! You dont know everything, your mom doesnt know everything, your friends dont know everything. Everyone is always learning when they have a baby so listen, watch & it will all come natural to you !!!!! 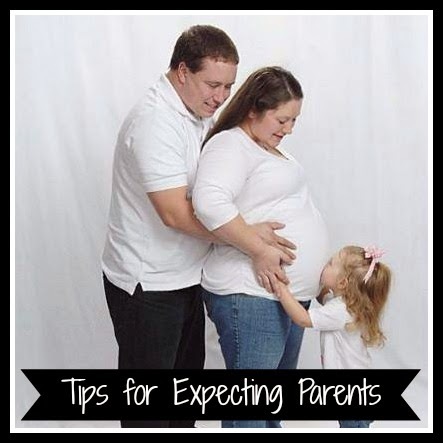 My tip for expecting parents is always have patience and stay organized as much as you can, it helps a lot. sing to the baby to sleep, put some soft music so you do not hear much noise and wake up very fast. Rest and sleep when the baby is asleep too. My best tip is to prepare as much as you can before the baby arrives, and have everything ready as soon as possible! My little girl surprised us at 35 weeks, and I had barely washed three of her shirts... we had to do everything else after we got home from the hospital! It was a pain! I'm expecting my first child so I am on the receiving end of this advice and the comments! My advice would be to receive help if someone offers! You don't have to have it all together! My advice is to stock up on diapers and wipes look for sales around a holiday and stock up. My best tip is to splurge on the things you will use all day every day like nice swaddles and skip all the giant "baby gear" items that may only get used a handful of times. My tip is to not try to overdo anything. Take it easy and go back to basics. Take many naps before your baby is born. You won't get many chances for naps afterwards. If anyone offers their help, take it!! You will need the rest. My one tip is get your rest. Sleep when the baby sleeps that way you are not robbed of precious time. My tip for parents is to sleep when you can. Sleep as much as you can! You need your rest. I know it is tempting to get that load of laundry or dishes done but you will be better off resting! Sometimes it's ok to let things go, like dishes or picking up, making sure your getting enough rest/sleep is more important. Start your baby on routine/schedule if at all possible, and try to sleep when your baby is sleeping. Don't be afraid to ask (and utilize) help. I'm actually expecting my second child in February, so I'm not 100% sure what I'm getting myself into, but I feel as if the best advice that I have received and that I would relay to other people would have to be, ALWAYS include your first child, allow them to help and make them feel needed. Raise your baby the way YOU want to. It's okay to take advice from others, but don't force yourself to do what others think is right. Trust your instincts!